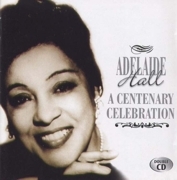 Released to commemorate the centenary of Adelaide's birth on October 20th 2001, this double CD compilation from Avid includes recordings of over fifty songs she made from 1927 to 1945. A central figure in the great resurgence of African American music in the 1920's, Adelaide was a jazz innovator who performed with such greats as Duke Ellington, Fats Waller and Art Tatum, all feature on this superbly re-mastered double CD. 11. Ain't It A Shame About Mame?